The Bible is full of journeys. Abraham's epic journey from Ur to the land of Canaan. The Hebrews' journey from slavery in Egypt to the Promised Land. Paul's revolutionary series of missionary journeys. But what was Mesopotamia? Where did Moses cross the Red Sea? Why were so many battles fought across the length and breadth of Palestine? Where was Golgotha - the Place of the Skull? And where did Paul's ship founder on the voyage to Rome? All these questions - and many more - are answered in the BIBLE ATLAS in which colourful, clear computer-generated maps provide a readily accessible backdrop to the Bible narrative. The BIBLE ATLAS also includes a full gazetteer of Bible places for easy reference. 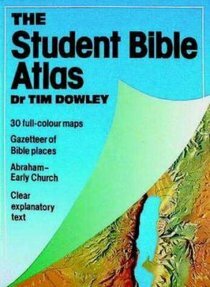 About "Bible Atlas (Essential Bible Reference Series)"
This is from a series of guide books for the home, school, church and Sundaychool. Discover the places where great events of the Bible occurred.